We are celebrating an exciting milestone here at iLoveToCreate, a Duncan Enterprises Company today! Our company turns 66 years old! It's an honor to be an American company with such a rich history and strong foundation that is continuing to thrive in today's challenging business landscape! Duncan Enterprises was started in Erma Duncan's garage in 1946. Over the 66 years, four generations of the Duncan family have proudly grown and expanded the business to be leaders in both ceramics and crafting. Today, iLoveToCreate is one of the largest ceramic arts, crafting adhesives and fashion art manufacturers in the world with its ongoing reputation for excellence in product development, quality, education and health & safety. In July 2009, Duncan Enterprises officially changed its name to iLoveToCreate®, a Duncan Enterprises Company. iLoveToCreate leads the ceramics industry with Duncan Ceramics and the craft industry with comprehensive Fashion Art programs under the Tulip®, Scribbles® and Puffy™ brand names. iLoveToCreate also produces the top crafting glues and adhesives in the industry under the Aleene's® brand name, and recently introduced the Crafty Chica™ brand and line of products. We sat down with Larry Duncan, President & Chief Executive Officer of Duncan Enterprises and got his thoughts and perspective on being a guiding force in such a successful family-owned business. 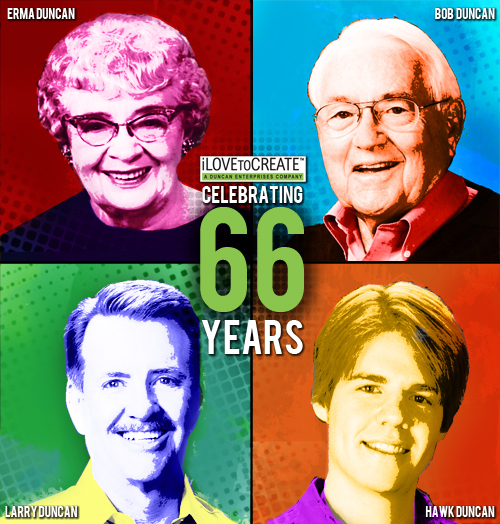 66 years! That's such an achievement, especially in these tough economic times. Why has the company continued to remain strong even during these challenging periods? We have a quote in our auditorium, “It is teamwork that remains the ultimate competitive advantage, both because it is so POWERFUL and so RARE.” If you can get all the people in an organization rowing in the same direction, you can really be successful in any industry, in any market, against any competition, at any time. How are you keeping creativity in the family these days? My wife, Sharon, and daughter, Summer, are the really creative ones in my family with interior improvements and decorating DIY, making clothes, cooking and more. My son Hawk is creative musically. My creativity revolves around my collection and love of my animals. (Larry has everything from small reptiles to horses and a zebra, and everything in between). Your son Hawk represents the 4th generation of the Duncan family and is very active and hands-on within the company. What advice have you given him? How has it changed from what you learned from your father? I have encouraged him to embrace our Guiding Principles from a personal point of view. Both of my children have heard and learned them since they were very small. I learned pretty much the same thing from my dad (Bob Duncan). What one thing may people be surprised to know about you? I love speed and an occasional adrenaline rush. Drives my wife crazy. Why is creativity so important to you? Without it, we wouldn’t have our business! We truly love the absolute joy creativity brings to people’s lives. It’s amazing to show people who don’t think they are creative how easy it can be. Here's a video example of the amazing teamwork that goes on in our organization. This is a really cool view into what we do on a day to day basis at iLoveToCreate. Learn more about the history of iLoveToCreate on the About Us page on our web site. Make your surrounding funny by saying funny quotes and sayings. These quotes are very funny which will not stop from laughing, read them today.